A Charlotte developer is starting work on an affordable-housing project in the Belmont neighborhood. Laurel Street Residential, in partnership with St. Paul Baptist Church, will break ground on an affordable multifamily development at 1322 Allen St. at 6 p.m. today . The 112-unit community will include a 60-unit, senior-housing building, 29 townhouse-style units and a 23-unit garden-style apartment building. The rentals are designated for seniors and families that earn 60% of the area’s medium income and below for their appropriate household size. Today’s event will be in the youth sanctuary of St. Paul Baptist Church, at 1401 Allen St., and will include several speakers — George Dunlap, Mecklenburg County commissioner and chairman of the St. Paul board of directors; Mecklenburg County Board of Commissioners Chairman Trevor Fuller; Councilwoman Patsy Kinsey; and Gwen Garnett, president of Zechariah Alexander Community Development Corp., an affiliate of St. Paul Baptist and a financier to the project. The development serves as the residential component of the envisioned master plan by St. Paul Baptist Church to expand affordable housing in the Belmont neighborhood. Amenities will include outdoor sitting areas, a playground, a computer center, a community room, a fitness center and a covered picnic area. The stated goal of the project is to help manage the impact of gentrification on the local community while respecting the medium-density residential character and the history of the surrounding neighborhood. St. Paul Baptist Church has been on Allen Street since it was displaced in 1969 during the Brooklyn neighborhood urban renewal initiative. Laurel Street Residential, general contractor Miles McClellan Construction, architect Neighboring Concepts and civil engineer Bohler Engineering are working on the project. The development is being financed by public and private investments, including a 4% tax credit and tax-exempt bond allocation from the N.C. Housing Finance Agency, a $4.35 million loan from the City of Charlotte Housing Trust Fund, an $8 million construction loan from Bank of America, permanent financing from Greystone, and loans from the Zechariah Alexander CDC and St. Paul Baptist Church. Affordable housing continues to be a challenge in Charlotte as the city grows, causing apartment rates to spike. The median monthly rent for a one-bedroom unit in Charlotte in July was $1,050, according to Apartment List’s August report. A two-bedroom apartment in the Queen City costs an average of $1,150 a month. According to the report, local rental rates have increased over the year by 3.6%. Nationally, Charlotte is ranked 32nd-highest for one-bedroom rental rates. 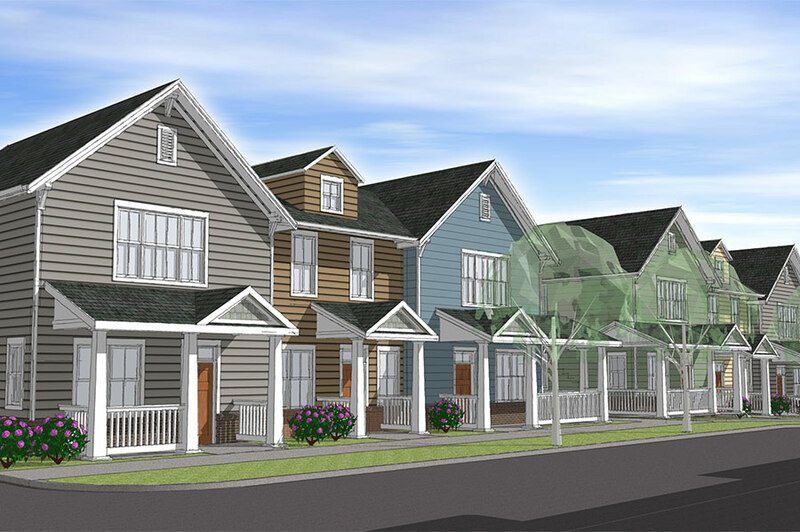 In Charlotte, Laurel Street Residential’s portfolio also includes The Renaissance on East Boulevard, developed in partnership with the Charlotte Housing Authority, that contains a mixture of age-restricted, mixed-income and affordable-housing units.